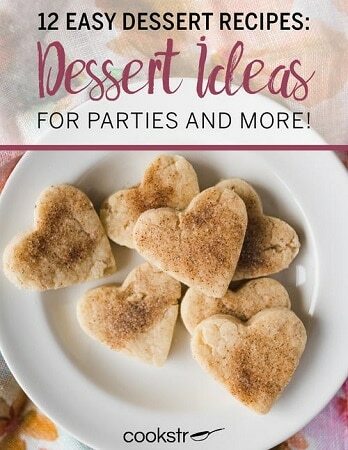 Right now at Cookstr.com you can download the eCookbook, “Dessert Ideas for Parties and More“ for FREE! All you have to do is enter your email in the popup box to get access to it. Inside 12 Easy Dessert Recipes: Dessert Ideas for Parties and More, you’ll learn all the techniques you need to create perfect desserts with recipes and tips from professional chefs. From chocolate cake to fruit salad, and from apple pie to carrot cupcakes, we’ve provided a variety of dessert recipes to satisfy any and all sugar cravings. Ohhh sounds like a good one to have! I love cookbooks, and you can’t beat free!